My colleague and friend, Angie Bush, is attending the National Genealogical Society's conference in Richmond, Virginia this week. She has kindly agreed to fill my readers in on any interesting DNA news from NGS. Her report on the AncestryDNA presentation given by Kenny Freestone follows. 1. In response to questions about AncestryDNA's plans for adding a chromosome browser or segment data, Kenny repeated that Ancestry is working on something that would give their customers access to that type of data, but that it would be something different than what current chromosome browsers offer. No date was provided for launch or when such a feature might appear. He did admit that at this point the tools that Ancestry has for triangulating data are quite lacking. This tells me that they recognize that there is a need for these features. I can only hope that when these new tools are finally released that they really are as good as what they are claimed to be. I found it very interesting that he used a slide showing how he inherited DNA from a set of third great-grandparents and that he illustrated chromosomes, but that Ancestry provides their customers no way to view this type of information. 2. In a somewhat related slide, Kenny showed several of his lines that had been "confirmed" by DNA shaky leaf hints. He said that this was "independent" evidence that his tree was correct. As readers of this blog know, unfortunately you cannot always say that is the case. As a serious genealogist and scientist, I continue to find the lack of segment data to be a problem. In both disciplines it is imperative that data be able to be reviewed. On the genealogy side of Ancestry's site, they do provide the actual images or data in many instances. When viewing any educational video by Ancestry, there is always encouragement to look at the actual image, as it contains so much more information than the transcription. I just cannot understand why this same level of access to the underlying data is kept hidden on the DNA side of their site. 3. Kenny was asked a question by someone who has Jewish background regarding why there are so many matches at a high level and yet no common ancestor is discovered. Genetic genealogists who have worked with endogamous populations know this can a difficult problem. Kenny did say that they are actively working on this issue, but have not yet come up with a solution. This slide raised a question as to whether or not AncestryDNA is using centimorgans or megabases in their matching algorithms. Kenny clarified that they are using a combination. They switched to using centimorgans in November - December 2013. If you tested recently, then your matches are in centimorgans. If it was prior to that date, then your matches are in megabases. 5. Kenny told us that the communication/contact rate between DNA customers was twice that the communication rate between regular customers. 6. 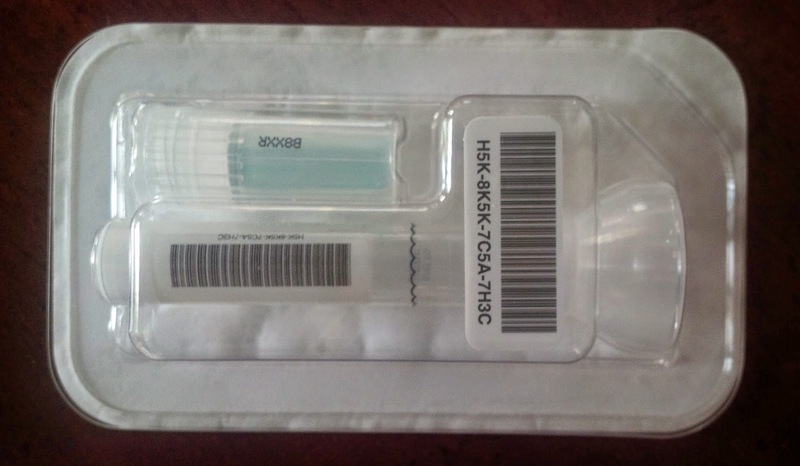 An audience member asked if Ancestry stored the sample for future/other tests. Kenny didn't directly answer this and said that as the science improves that they will just apply those improvements to the current test. He did say that the only thing better than their test was a full genome sequence, and for that a new sample would need to be submitted. 7. I appreciated the fact that Kenny emphasized that the ethnicity information is an ESTIMATE. It is important that we all remember that the science that each company uses to give us our admixture is still in it's infancy and that each company uses different reference populations to do so. It behooves all of us to take this information with a grain of salt no matter which company we test with. 8. Kenny did a great job answering several questions from audience members regarding Y-DNA and mtDNA testing that were completely unrelated to the product that AncestryDNA offers. Attendees even had specific questions about surname and haplogroup projects. This highlighted the need for those of us in the genetic genealogy community to reach out to the genealogists and help them to understand the power of DNA. Things we take for granted such as the three types of tests and the companies that offer these tests can be confusing. If DNA is to be effectively used as a genealogical research tool or record, there is a significant amount of education that will need to be done. 9. 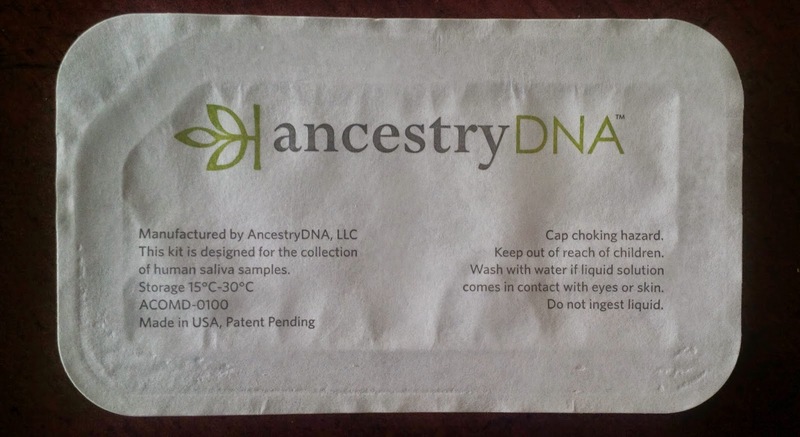 Lastly, after the presentation, Kenny showed me that Ancestry has a new "spit kit." 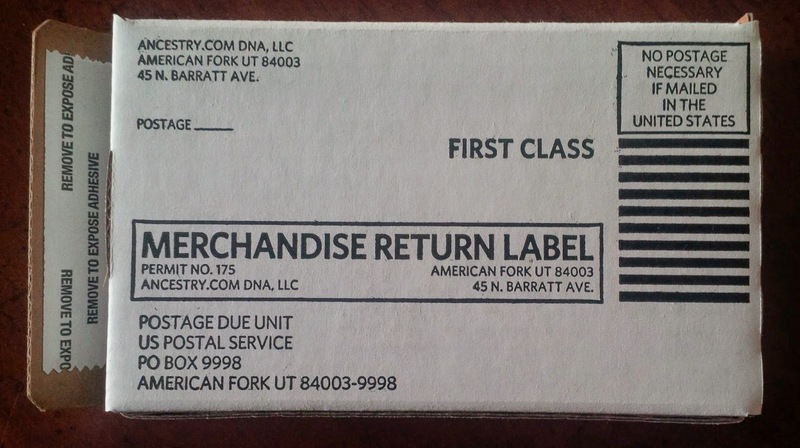 The return box and packaging are much more compact now and the kit itself is a bit different. I asked if there were plans to offer some type of assisted collection kit or "cheek swab" as the spit kit can be difficult for older individuals. He said that they recognized this was a need and that Ancestry probably would do something to address it, but that he couldn't confirm anything. Thanks to Angie for this AncestryDNA/NGS update! What struck me about Kenny's presentation was the strong emphasis on the science that underlies the product. I was curious how receptive the broader traditional genealogy community would be to that level of detail. Folks seemed engaged with lots of questions, and I think that's promising in terms of growing interest in more detailed tools. Hopefully we'll see some of those rolled out soon. It was very informative to getting and not getting answers we long seek. Appreciate the Blog piece! Also, to add: when asked if the test would be offered to overseas customers anytime soon, they said there were no updates on that front at this time. This was a question that came up outside of Kenny's presentation. Thanks for the update. The ability to lock their family trees when they have submitted DNA is also a huge downsize to Ancestry DNA. I always suggest Gedmatch so I can get a clue but that doesn't always work. Hopefully Ancestry will come up with something compatible on their own site. I usually recommend it last. I am amazed by how poorly understood genetic genealogy is, even among those who have a vested interest in understanding it. I’m afraid that very few understand the importance of triangulation and many are misled by AncestryDNA’s shaky leaves. A couple of simple diagrams could make this very clear. This problem would also become clear for more Ancestry customers if they could see that they have matches who share two ancestral lines but share only one DNA segment. Maybe releasing customers’ matching segment data would burst a few bubbles, but the truth needs to come out or this is going to become pseudoscience for a lot of people. "If you tested recently, then your matches are in centimorgans. If it was prior to that date, then your matches are in megabases." As someone who tested before the switch, does this mean that my matches are stuck in megabases in perpetuity, or does this mean that my older matches are measured in megabases and my newer ones are measured in centimorgans? Going forward, I hope Ancestry can see the necessity of opening matching segment data, at least for those who would be inclined to opt in. At some point, AncestryDNA could become a bit tarnished when people begin to learn that the shaky leaf hints are unconfirmed possibilities that could be dead wrong. i'm hopeful for the chromosome browser. I have only myself and my paternal grandmother tested on Ancestry, but several of those who are definitely related (by paper) to me through her, do not match her at all. These are generally 4th-6th cousins. I also wish they'd switch over to cM for those tested prior to Nov 2013. I also hope that at some point they're able to implement something akin to FTDNA's "in common with" function. I find that immensely helpful. Has anyone of heard if Ancestry.com will allow us to download a list of our match names by clicking a button. We can do that at 23andme and familytreedna. Ancestry does not want to provide a chromosome browser because of privacy concerns. We already know our match names. I do know about the Jeff Snavely app. But I think Ancestry could do this and be much easier to do. Comparing lists of names is another tool besides looking at the actual dna segments. I think it would be helpful for me. Is there a place where suggestions can be sent to Ancestry. Thank you. Just wondering if those that use Ancestry.com recommend they download dna file and then upload at familytreedna. The tools are better at ftdna and also potential of new matches that did not test at ancestry. Sigh, it's September, and still no chromosome data. How can they live with themselves?